Lookie- Lookie. Nars store opening sneak peek via WWD.com. Apparently the NARS store will be opening one day early on Feb 9th. How exciting!! 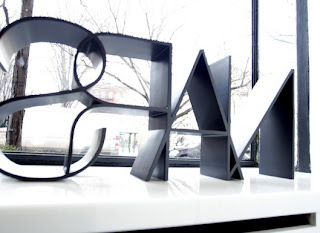 "His (Francois Nars) personality is reflected in his new store. Nars tricked out the store, which he designed with Fabien Baron, with numerous custom-made built-ins. The intimate space features a custom tester unit that takes one long wall and showcases all of the colors in the Nars line. On the boutique’s opposite wall, a mirrored wall with lighting at face level beckons, along with custom-designed trays that slide out, allowing Nars artists to easily access products when demonstrating them. Near the front door, a white fireplace mantel with a built-in bookshelf above the door beckons, filled with all of Nars’ favorite nonmakeup things — DVDs of Catherine Deneuve’s “Belle de Jour” and Barbra Streisand’s “Funny Girl,” a copy of the novel “All About Eve” and a shocking-pink copy of a biography of Elsa Schiaparelli among them. (Her devotees can find a nail polish hue bearing her name that precisely matches the book on the opposite wall.)" The store will be an experimental space for more stores to come to expect some great things with special details. There also will be a lot of exclusives (including the 413 Bleecker st lipstick namesake) there including some sort of collaboration with long time friend Marc Jacobs. I can not wait to stop by. Who else is going to check it out?